Last month I wrote about a Wood Duck that appeared injured and needed to be taken to the wildlife rehab facility. He was walking, unable to fly, and offered little resistance when we picked him up and drove him to Willowbrook Wildlife Center. Spring is a busy time for the rescue organizations and they were swamped with patients. They promised to let us know if the bird recovered. A few weeks later I received an email letting me know that the duck had fully recovered. He did not have any injuries but was suffering from exhaustion and dehydration. He was released back into the wild at the same location where we found him. This is a picture of a different Wood Duck I saw a few weeks ago in the wetland area of the nature park by my house. There are a lot of Wood Ducks in the area, so I’m sure it is a different duck than the one I rescued. Wood Ducks are shy birds and rarely come out into the open, preferring swampy areas within the woods. After all the rain this past week, they will have their privacy. The mosquitoes in that section of the woods are fierce, and hungry, and I’m staying out of there. And did I mention there is poison ivy in the woods? Yeah, lots of that too. Ooh, definitely staying away from the poison ivy! How great to hear that the duck has recovered and was released. Thanks for sharing. I’m so glad the duck recovered! Hope you haven’t had personal experience with the poison ivy! Great pic, Leslie. How great; you did good. We spent the last 45 days or so watching the hatching of falcon eggs and the maturity of the offspring on webcam. Its and annual even and bittersweet as they will take flight any day now. The parents will be back to nest again most likely next spring. I’m so glad that your bird recovered, and it’s so nice that they made the time to let you know how he went. 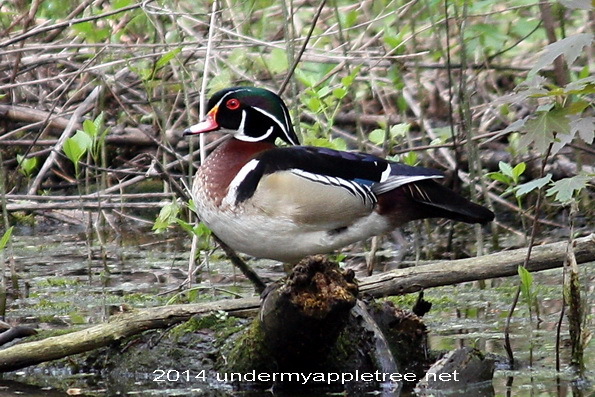 Your wood ducks are such beautiful birds. We have wood ducks here in Australia- but they’re quite different to yours, much less spectacular. I’m glad to hear the wood duck is doing well. It looks like the one in that photo was posing for you. I remember reading about the duck being rescued and its good to see that the story had a happy ending. We have plenty of swamps around us but we don’t seem to have a lot of ducks for some reason. Beautiful photo! Thank you for helping the other Wood Duck. Ahhh, so happy the wood duck is healthy again.